Posted on 3rd February 2009 — I wanted to share a few news items with regular (and new!) visitors of jQuery for Designers. Some people will know from following me on Twitter that I was approached about doing a jQuery for Designers book late last year. Last week the project has been officially agreed and is moving forward. The publishers are Manning, and I understand they also have an early access programme in place (which I’ll announce as soon as anything is available – should be around late March I believe). The book will be aimed at the designers and newbies wanting to create interaction in their projects, and how it can be achieved using jQuery. The book is recipe based, and gradually tries to solve bigger and more complicated problems. The first chapter is already done and ready to be sent to the publishers, and I’m looking at a completion date of around the end of June – after which it’s down to Manning to publish it (again, I’ll keep you updated). Leading in to what I’ll be talking about next, jQuery for Designers has a new logo – though it’s not in use just yet. There were a great number of submissions for the new logo, but this one I (and some of you) liked the most (plus, there’s, kind of, a hidden easter egg in the logo, can you see it? – I though was cute!). Last, but certainly not least, jQuery for Designers is getting a long overdue redesign. I started this blog in December 2007 (having sat on the idea for well over 6 months), and I grabbed the first WordPress theme that I thought looked clean enough. Since the focus quickly shifted from written tutorial content to screencasts, I need a theme that reflects that (although I’m continuing to support screencasts with the written tutorial). A good designer and friend of mine, Chris Mahon, is working on the wireframes for the design and I’ll be upgrading the theme in the coming months. 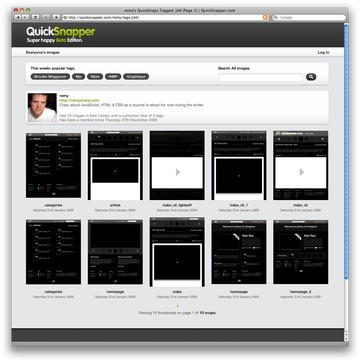 I’ve uploaded Chris’ wireframes to QuickSnapper for you to see what we’re planning. Annoyingly the order and timestamps were lost from the original wires, but feel free to comment either on this post, or on the individual screenshots – positive or negative. They’re obviously just wires (and there’s a few empty blocks that indicate so), but all feedback is welcome to help us make the final design great for you.